You are here: Home / Ice hockey / Quack. Quack. Quack. I like to think of my hockey classmates as a band of brothers and sisters. 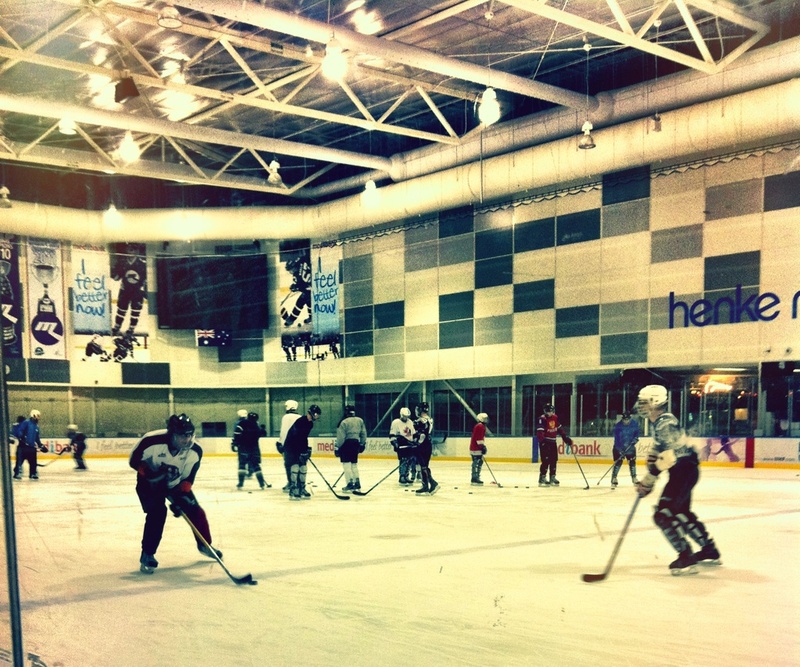 We skate together, we bite ice together, we battle stinky hockey gear together. Sadly, this week there was a dangerous edge to the locker room. Even more sadly, there is no dispute that I was the cause of it. Anybody who believes Facebook is not dangerous, heed this story. Like CW Stoneking’s “Love Me Or Die”, Facebook should be used carefully, else a powerful voodoo may bring undone the person or the thing you love. 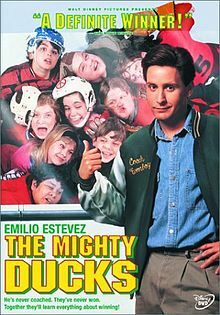 Well, I admitted to our catchily-titled “2011 Icehouse Intermediate Hockey Group” that I considered “Mighty Ducks” to be a crap film. I ventured my opinion on the merits, or lack thereof, of this 1992 classic, alternatively-named “Champions” (talk about give away the ending, btw). I know, I know. I’m sorry, alright? It would be fair to say our Facebook group went nuts. It’s a closed group, thankfully, so the public wasn’t exposed to the vitriol. We’re hockey players, so the language can get fruity. 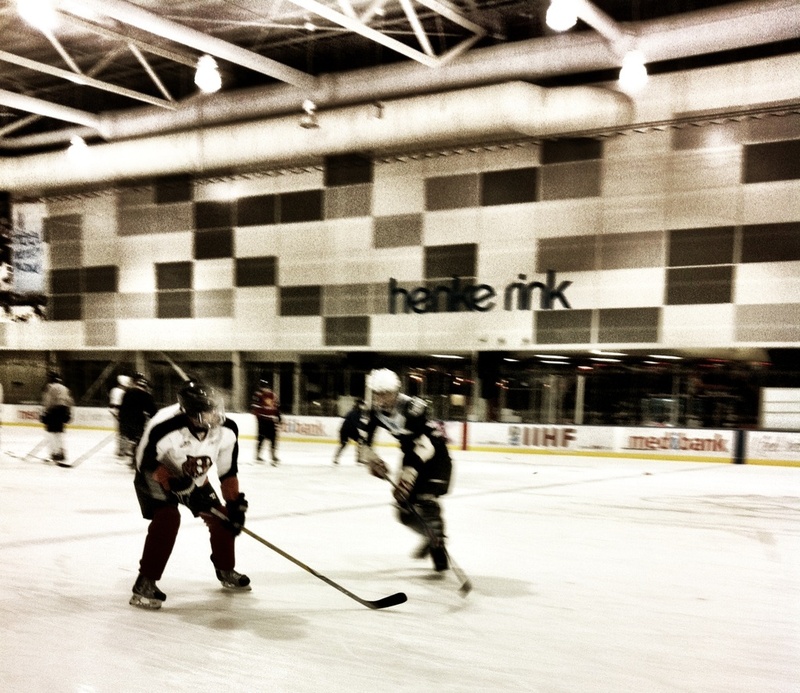 The only win was that nobody dobbed me in to Lliam Webster, our coach and the hard man of Melbourne Ice. I know for a fact he loves the film, and he attacked me with a stick tonight, anyway, but playfully, so I dodged a bullet there. Me (left), shaping up to take on a defender, tonight. Pic by Will. There’s no way you could possibly guess what happens. So anyway, it turns out 75 per cent of our Facebook group only got into hockey because of this film. Goldberg, the fat kid goalie, is regarded as an icon. Nobody has any issues with Gordon heading off to try out as a player at the end of the film. I’m not criticising. It’s the greatest film ever made. And there were sequels, which I am yet to enjoy. Oh boy. By the time I headed to the Icehouse tonight – accompanied by an enthusiastic spectator in Will (sidelined by toe surgery), eagerly along for the juicy prospect of extreme violence and the likely death of his father – online threats of “boarding” me and worse had been made, including a pledge for the whole class to stand over my fallen body, doing the Ducks’ famous “Quack” chant. Me, beating a defender, tonight. He shoots. He scores! Happily, my teammates decided to let me live and I actually had an awesome class, learning forward-to-backward transitions, doing lots of passing, backward skating, shooting for goal and one-on-one forward versus D.
It was one of those rare classes where my feet felt right in the skates, I had my balance and the world actually worked for me, in that the move we had to learn was snow-plough-based, as against the hockey-stop lean-back. As the only person on the ice who is still crap at hockey stops, the urgent snow plough remains my only stopping option, all weight on the front leg, which is what tonight’s main move required. Who knows? Maybe falling over every-other-pivot will turn out to be a strength too in the weeks ahead? Either way, I’m not scared any more. All I have to do is invoke the spirit, pluck and sheer goddamn decency of Charlie Conway, captain of the Ducks.